SACRAMENTO, Calif. (AP) Out of sync for most of the first three quarters, the San Antonio Spurs got a big lift from LaMarcus Aldridge down the stretch and an even bigger boost off the bench from Davis Bertans. With star forward Kawhi Leonard sidelined indefinitely by a left shoulder tear, it was the perfect combination to keep San Antonio’s three-year winning streak against Sacramento going. 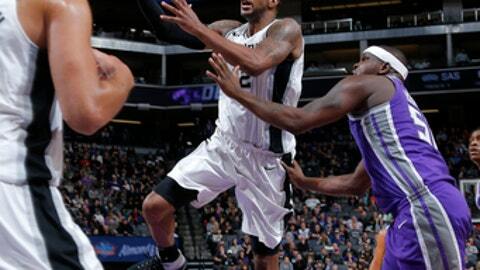 Aldridge had 31 points and 12 rebounds, Bertans scored a career-high 28 and the Spurs came back from 13 down in the second half to beat the Kings 107-100 on Monday night. Aldridge provided his normal spark while dominating down low. He scored 21 points in the second half, including six over the final two minutes. Bertans was just as crisp. The 25-year-old Latvian shot 11 of 15 and made a career-high six 3-pointers while teaming with Aldridge to lead the comeback. Patty Mills added 14 points and five assists, and Bryn Forbes scored 12 to help the Spurs to their 12th consecutive win over the Kings. ”Guys were playing hard but we were making fatigue mistakes, throwing the ball out of bounds, throwing it to the other team,” Aldridge said. Spurs: Manu Ginobili was given the night off after scoring a season-high 26 points in the loss to Portland on Sunday. … Danny Green (groin tightness) missed his fourth consecutive game. Kings: Cauley-Stein had 10 points and five rebounds in the first quarter. … George Hill missed his second straight game for personal reasons.